It was a project that supports land managers in the efficient management of on-farm nutrients and soil in rural Conwy, so reducing diffuse pollution. The full project title was: Improving Catchment Environmental quality by better Nutrient management in the livestock Farming landscape. The active phase of the project ran from May 2009 until September 2011 but the valued network of local farmers built-up during this time along with the goodwill and trust shown to project officers by the farmers and their Unions will hopefully live on long beyond the project. The results and findings of the project are reported in a project handbook which has been uploaded onto this website and also exists in paper form and can be requested free of charge from: Nia Evans, RDP Project Development Officer, Community Development Service – Rural, CONWY County Borough Council. 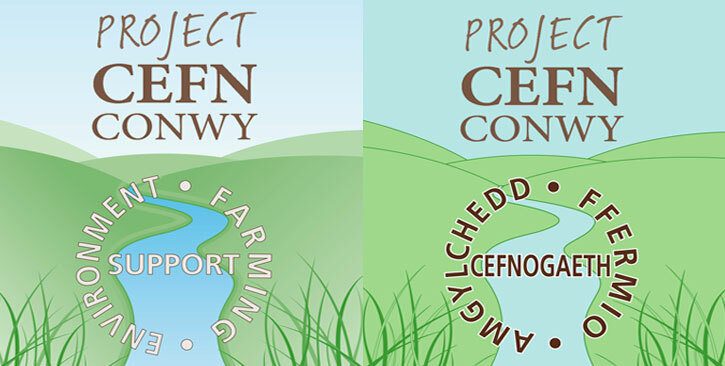 "The FUW has followed the progress of the CEFN Conwy with interest and has supported the aims of the project throughout its two-year operation. Projects like this, that set out to identify at first-hand how farmers in rural Wales manage their land with both the rural economy and care for the environment in mind, are welcomed by the FUW." "The NFU Cymru has been involved with CEFN Conwy since its inception and has remained proactive throughout the project, ensuring its member farmers were informed about the opportunities the project presented to them. The NFU Cymru particularly applauds the hands-on approach the project has adopted whilst working with farmers in Conwy and welcomes this pamphlet as a summary of the project and its findings." This project was part funded through the Rural Development Plan which was part financed by the European Union and the Welsh Assembly Government.